Compulsory for all students who attend Catholic schools payable to the Archdiocese of Wellington (ADW). Please see the accompanying information from ADW. Accounts are sent out to families from ADW and Attendance Dues accounts are payable directly to ADW. Please do not pay Attendance Dues to St Bernard’s College. All queries with regards Attendance Dues accounts should be directed to ADW ph 0800 462725 in the first instance. We have determined that charges for materials that students take home, items purchased on behalf of students, EOTC (education outside the classroom) and the costs of participating in sports competitions, especially when it involves direct charges such as transport are chargeable under the Education Act. Avoidable damages to or losses by students of school property including buildings and furnishings, books, and equipment will also be charged. For students in all years. The ID card can be used for reduced travel fares and other student discounts. The diary will allow junior students to record homework and organise their learning. Senior students are expected to use their BYOD to manage and record their learning. For students in all years. This will allow all students and parents to access our learning environment at parent.sbc.school.nz. For students in years 7-10. Covers EOTC programme trips which have a significant travel and admission component. For students in all years. This covers transport, accommodation and meals for retreats which are an essential part of our Marist Catholic character. These are itemised on the accompanying schedule. They apply only to students taking those subjects and cover trips, admissions, and materials or resources that the students keep to take home. $100 per instrument per year. This charge allows more lesson time and in some cases individual tuition which is not funded by the Ministry of Education. These lessons are optional for most students but necessary for those wishing to study music beyond year 9 and who are not receiving private tuition. This is paid to the Marist Community Development Trust. The funds will be used to provide services and facilities for the benefit of all students. The trust relies on your generosity in making the donation in order to meet many costs that are not covered by state funding. $40 per year for students in years 9 to13. This gives membership to the old boys’ association. Please see the accompanying Information about The SBCOBA. Sports charges reflect the cost of facilities, levies and the cost of entering College Sport Wellington competitions. Students who participate in sports requiring personal equipment (i.e tennis, cricket, waterpolo, softball etc) will be required to provide their own equipment. The sports registration deadline is Friday 2nd February 2018 for summer sports. Winter sport registrations close on Friday 23rd March 2018. Students will not be allowed to register for sports unless the registration form is completed and signed and payment arrangements have been made. They are added to student’s accounts and are payable in term 3. Considerable discounts to NZQA fees are available for NZ families who qualify for financial assistance and meet criteria set by NZQA. Application forms for NZQA fee reductions must be completed and returned to the College within the time frame specified by NZQA. A statement of account will be sent each term for your son's outstanding school charges. Curriculum charges depend upon your son's subject choices. These and other charges will be invoiced when subjects are confirmed. Families wanting to set up an automatic payment (AP) or make payment in full before the first statement arrives can use the schedule of charges to calculate the full cost. Payments may be made by cheque, cash, EFTPOS, credit card and by internet banking or automatic payment (AP). Please set up your automatic payment online or through your bank. Please make cheques payable to St Bernard's College. Receipts are issued for payments made and given to students to take home. Receipts are not issued for regular A/P amounts. For help with your forms and / or payments please contact Nicola Graham at the College office on ph 560-9250 extn 861. If you are in a situation of hardship, please contact Dominic Outtrim, Business Manager to discuss your circumstances so that other arrangements can be made. 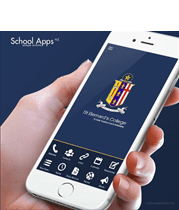 In enrolling your son at St Bernard’s College you agreed to pay charges determined by the Board of Trustees. The charges apply to all students according to the schedules. The administration of all charges is through the finance department located in the main office. Under certain circumstances, payment may need to be made before participation can be assured.